2019 is here and it’s time to ditch the old and get with the new. If you’re all about redecorating and shifting your home’s look to set new trends and create an always-stylish atmosphere, the interior decorators and painters of the world have suggestions for you to get your new year off to a hot start. Warm and creamy, almost invoking a fresh cup of coffee, hazelnut is in no danger of losing its fashionableness. The hue goes with many types of furniture while brightening up any area of the house. 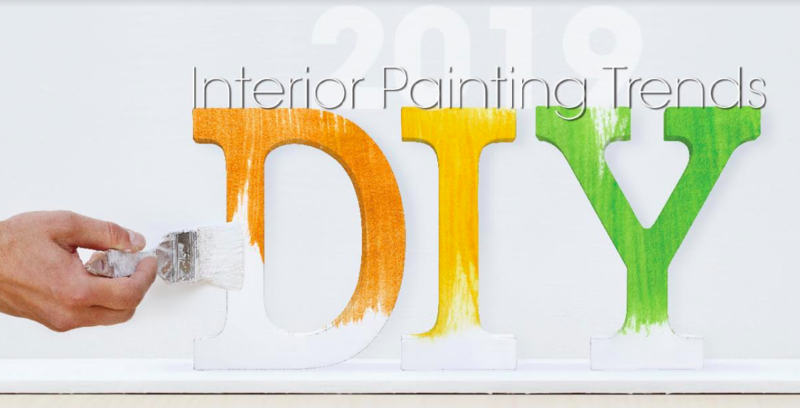 Some interior decorators even suggest walking through your house and tallying up all the areas that could use some brighter colors—these are the perfect areas for a complete interior re-paint or an accent wall. Small, light-filled rooms can also benefit from a hazelnut hue, because the light bouncing off the walls will make it appear larger. For the last few years now, dove gray has ruled the grays as a go-to classic paint color to create a modern alternative to stark neutral paints. Lilac gray is a bit moodier, yet the lilac undertones simultaneously make the gray a bit cheerier and warmer. Lilac gray is also more gender neutral, eschewing the decidedly masculine feel of dove gray. It’s the perfect in-between interior hue that’s stately but not overbearing, serious but not grave, subtle but not boring, and a refreshing alternative to traditional interior grays. Last gray hue, I promise. Metropolitan is already a popular color from Benjamin Moore’s collection. It’s a calm and composed color, sophisticated, and a perfectly balanced hue for most interior spaces. The effect it has on most rooms is a surprisingly lighter feel without blinding you. It’s dark enough to create a sophisticated atmosphere, yet light enough to exude energy and grace. Blueprint is a specific paint color from Behr. It’s similar to turquoise or blue-green, making it approachable for kids’ rooms or studies. Blueprint was created to resemble the blue ink architects use to sketch their designs. This soft, mid-tone blue is perfect either with a matte or high gloss finish. Similar to Blueprint, Night Watch is a dark, rich, hunter green making a resurgence after fading out of fashion in the 1990s. The idea behind Night Watch is to invoke the natural healing power of lush botanicals and, more generally, the healing, restorative power of nature. It’s an intense color that can sometimes overpower smaller, less well-lit rooms. Most designers recommend it for dining rooms or lounges—places that are more open and get at least some sunlight. PPG Paints even went so far as to call Night Watch one its top 2019 paint colors overall. Which Colors Will Work for You? You have to pay attention to matching color schemes in interior areas with multiple hues, as well as the amount of light or darkness each of your rooms get before deciding on interior paint colors. Consult the painting experts at Ireland’s Finest to get started on your next interior painting project.